The humble tea leaf and the ritual of enjoyment, no matter how casual, carries the power to transform our mood and create personal history for us. 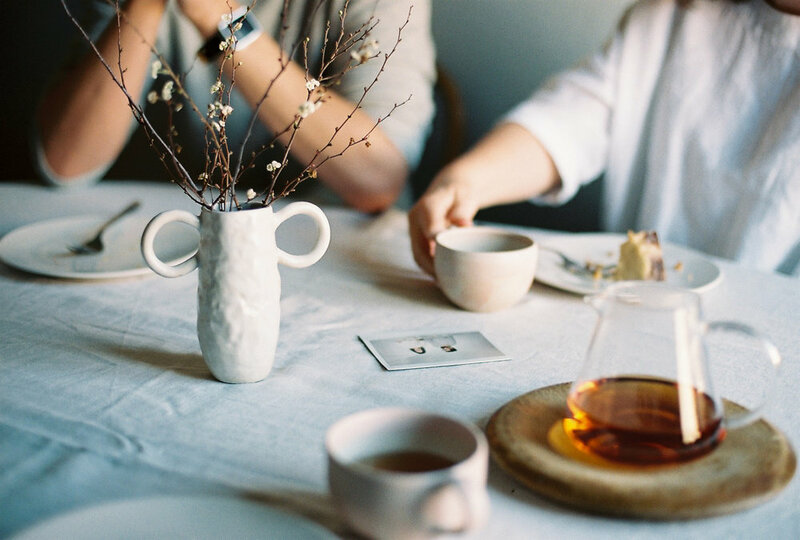 Whether that means stimulating conversation around a communal table, or bringing tranquillity to a solitary setting, tea is philosophy for the soul. Friends of Endeavour presents our friends with a handful of questions about how tea is integrated into their lifestyle, and how their personal preferences for sourcing, serving and enjoying tea came to be. In this new series, we visit our friends near and far, share conversations and several cups of their favourite brew. First up is Canberran local Kate Tweedie. Kate is a writer who takes lovely photographs that are a meditation on solitude and the everyday creative process. She’s also sweet and kind, and graciously invited us into her home on a Sunday morning. Many tea lovers say that their first experience of tea came from family, either from a relative who is a tea enthusiast or from the family routine of serving tea at different times of the day. Would you mind sharing your experience of tea growing up? When I think of my introduction to tea as a child, I can smell the heavy perfume of roses in full bloom as it wafts through the windows of the little house that was home to my two great aunts, Iris and Betty. Once their home as children, it became so again after lost loves and they lived out the rest of their days side by side. It was always joy to be in that house with its bustling kitchen, creaking floorboards and a slinking ginger cat named KB. I remember sweet peas in milk glass vases and heaving plates of buttered pikelets; my favourite time of day was, of course, tea time. I would take such a long time dithering in front of the china cabinet, trying to find the cup and saucer that would be just right. Iris would make the tea (hot, milky and so sweet I am still surprised to have never had a cavity) while Betty would shuffle the deck (those two broads taught me everything I ever knew and have since forgotten about playing cards, and they had the best poker faces in town!). My brother and I would sit at the table, likely kicking each other under the crochet tablecloth, waiting for our tea and both utterly mesmerised by those two wonderful women. For some people, the act of preparing tea is an intricate ceremony of ceramics, flowers, poetry and nature. For others, the preparation of tea might be as straightforward as a teaspoon of loose leaves in a teapot on a cosy weekend morning, or a quick teabag and mug of hot water before dashing off to work. 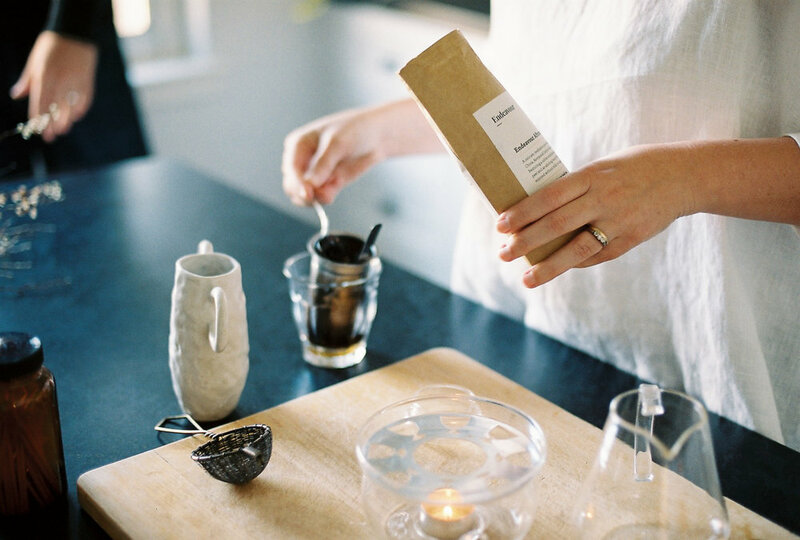 How would you describe your daily ritual of preparing and enjoying tea? Tea preparation has become my personal form of meditation and all begins with the very first cup. I wake early, as the stars twinkle their last. My first cup of tea for the day is taken alone — the silence and solitude of that time is very important to me. Silently rolling out of bed, I tiptoe into the kitchen with bare feet on creaking floorboards, gently shaking off the fog of sleep and almost feel it tumble from head to shoulders and into the aether. A favourite tea strainer is pulled from its place on the shelf along with a jar of tea leaves, the scent of which comforts me to no end. Leaning against the counter, I stand and watch the sky lighten through the kitchen window as the water boils. All is soft and quiet as the the tea steeps in a beloved cup and I smile a silent, sleepy, eyes-closed smile all to myself before stifling a yawn with warm hands quickly turning cold. A splash of milk and a stir of the spoon, with two taps on the lip of the cup both out of habit and for good measure. This ritual is repeated a few times each day. The constants being loose tea leaves and a stovetop kettle — both conscious choices for various reasons though mostly for their gift of time. Time to stop, to ponder and to be present with oneself. You’ve mentioned that drinking coffee isn’t a daily habit. In that case, what kind of tea do you like the most, and what would you enjoy serving it with? Peppermint tea ~ served with solitude. Black tea ~ served with almost anything, and preferably in a large pot to share. Floral tisane ~ served with something small and sweet, perhaps fresh scones with cream and a floral infused jam to complement such as rhubarb and rose or berries and lavender. Where do you find the inspiration for your creative endeavours in writing, photography and more generally, being you? I firmly believe the world can be a truly magical place if we choose to see it that way. More often than not I find inspiration, both personally and creatively, in the seemingly small, often overlooked, everyday kind of things. 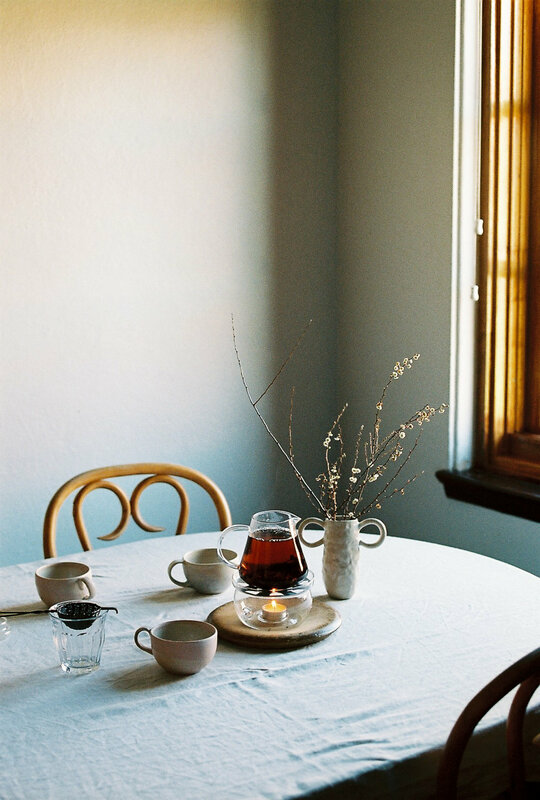 The changing of the seasons, the gentle curl of steam rising from a cup of tea, beautiful light, rumpled sheets, falling leaves, worn furniture with stories to tell. I am also very lucky to often be surrounded by some rather inspiring people and am grateful to call them my friends (your good selves included!). Time spent talking, and usually drinking tea, with these people always fills me up. What’s your recommended reading at the moment? My bedside table is piled high with books from the library at the moment. This teetering tower includes The White Road by Edmund de Waal, An Everlasting Meal by Tamar Adler and How to Sit by Thich Nhat Hanh, among others. During the cooler months I invariably find myself returning to the comfort of personal favourites like Jane Eyre, the Wildwood Chronicles and anything Nigel Slater or Mary Oliver have ever written. You’ve tried the other teas in our range, but Endeavour Afternoon is your favourite everyday blend. What do you think makes it such a standout? The subtlety, warmth and floral notes of the Endeavour Afternoon blend certainly make it my go-to tea most days. In truth, a floral element in a tea blend will win me over almost every time, but the depth of flavour of the black teas combined with the bright hint of citrus turn it into a comforting embrace I am happy to indulge in not just of an afternoon but any time of the day. See more of Kate’s beautiful photographs and words on her Instagram account and her website.